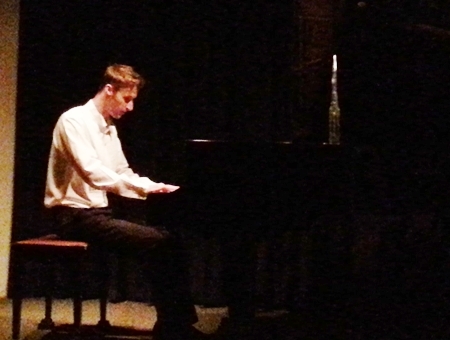 Bastien Gilson and Jonas Dept performed pieces from Haydn, Rachmaninov, Ganrados, Ginastera and more at their show at the AUA theater on May 28, 2013. Local favorite Jonas Dept has invited yet another of his talented pianist friends to visit our fair city and enthrall us all with fabulous music in the latest show “From Brussels to Belgium (by way of Moscow)”. The show, held at the AUA Auditorium on Tuesday, May 28, 2013 was a huge hit with the audience as the virtuoso display was only paralleled by the beauty of the music chosen. From dramatic to romantic, lively and fun, the performances by Bastien Gilson and Jonas Dept ensured that each audience member had their own personal favorite piece. I confess, I loved the romantic performance of Jean Absil’s “Marine” while another friend loved the drama and fire of Claude Debussy. The intricate pieces of Rachmaninov were another friend’s favorite while what has become one of Jonas’ signature pieces, George Gershwin’s “Rhapsody in Blue” closed out the show to a great round of applause. Chiang Mai is no stranger to talented musicians and the pleasure these two young men take in their music and the beauty of their performances makes us all the richer for having heard them play. Jonas Dept performs George Gershwin’s Rhapsody in Blue. at the post show party in Chiang Rai. After four successful shows to full houses, The Dodo Bird, took to the road to as did the show, Driving Miss Daisy. Both were directed by The Gate Theater Group’s (TGTG) director and actor, Stephan Turner. The Legend River Resort provided the venue to present this play to Chiang Rai’s community on Saturday, May 11. American Playwright Emanuel Fried, (March 1, 1913 -February 25, 2011) “Manny” had been a teacher of creative writing at State University College at Buffalo, New York. The Dodo Bird first appeared in the winter of 1972-73 in the issue of Drama and Theater, a magazine published by State University College, Fredonia, New York. Stephan formed The Gate Theater Group (TGTG) in 2007 with the intent of creating a non-profit English Language theater group within the old city of Chiang Mai where residents can become involved in live theater to entertain, inform, and educate. In 2010, TGTG became the first English speaking theater group ever to present a full season of live theater in Northern Thailand. Our audience enjoyed productions of The Gin Game, Strange Snow, The Eight Reindeer Monologues and a Community Outreach Program, Real Illusions, which was performed by Chiang Mai International School (CMIS) students. The Gate Theater is always looking for people who would like to be part of a live theatrical experience, either on stage or behind the scenes. [email protected] or www.gate-theater.com and FB. Jim Matchett plays Mick, the bartender, in the Gate Theater’s production of the Dodo Bird.